This entry was posted in Austerity, Greece, The People's Assembly Derby and tagged austerity, Austerity Fight The Cuts, Derby, Derby People's Assembly, DERBYSHIRE, Greece, Troika. So now we have had the final Conservative-Liberal annual budget before the UK general election in May. The Chancellor (finance minister) George Osborne waxed ecstatic in parliament that under his tutelage, the UK economy was the fastest growing in the G7 and in Europe and had created more jobs than anywhere else. He announced a few more ‘goodies’ supposedly for the poorer income earners, namely an increase in the allowance before people start paying income tax. This would take another 200,000 people out of paying tax by April 2017, but he failed to mention that these non-income tax payers would still be paying social security contributions even when they earning no more than £11,000 ($15,000) a year. And there were already up to 5 million workers who earn so little that this increase in allowance would gain them nothing. Indeed, most of the cost to the government budget from the increase will go to richer families with two incomes above the allowance. The government is now forecasting that the UK economy will grow 2.5% this year and 2.3% each year in the next parliament up to 2020. On this assumption, the Conservative chancellor has reduced the austerity spending cuts that he previously planned over the next five years. Even so, the government still plans to cut department services by £13bn and welfare benefits for the poorest and disabled by £12bn. And richer savers will get a reduction in tax rate on their interest. What the government plans to do is actually increase austerity up to 2018-19, sell another £20bn of public assets (bank shares) next year and then make “the biggest increase in real spending for a decade in 2019-20” – just before the next election! But can we expect these growth targets to be reached, with 65% confidence as the OBR reckons, after the performance of the UK economy in the last five years under the coalition? The FT newspaper spelt out what was expected back then and what happened (http://www.ft.com/cms/s/0/2da09f02-cbe3-11e4-aeb5-00144feab7de.html#axzz3Uk5bE037)? The forecast was for real GDP growth of 2.7% a year up to 2015. Instead, there was no growth at all in 2011 and 2012. The level of GDP is still 5% lower today than the 2010 forecast. Unemployment fell more quickly than expected as companies kept on labour but stopped any wage rises (and reduced wages and conditions in some cases), increasing employment in part-time, casual and so-called ‘zero hours’ contracts. So private sector employment eventually went up (public sector employment has been decimated), but real GDP did not so much. 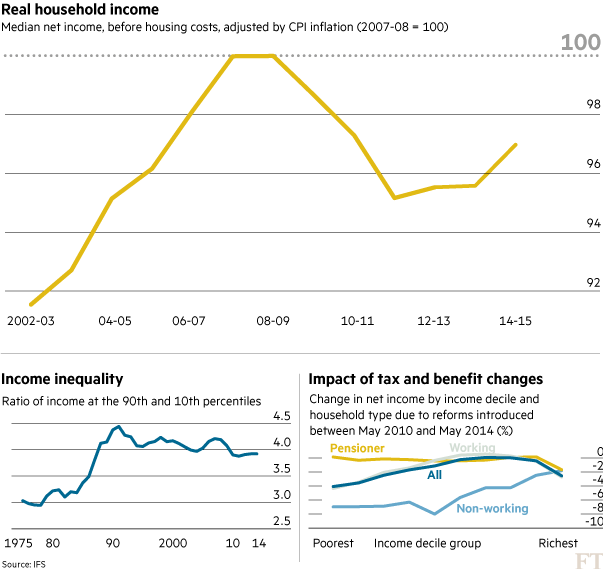 So output per worker fell and then stagnated. Productivity growth was non-existent throughout George Osborne’s period as chancellor. Back in 2010, the government predicted that wages from work would be rising by 5.4% a year by now. Currently they are rising by just 1.6% a year. 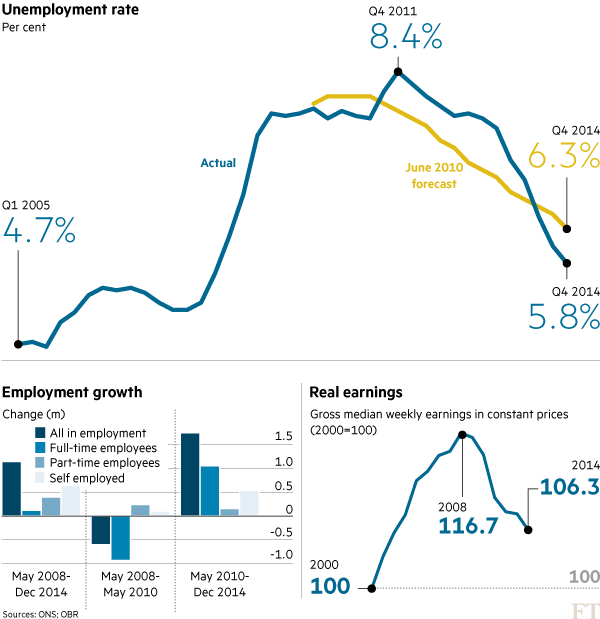 So average real incomes are still way below their peak back in 2008. And what of the much vaunted objective of balancing the books for the government by the end of this parliament? Well, poor economic growth translated into weak wage growth and then into less than expected tax revenues. So the government had to impose even harsher spending cuts. But it still failed to reach its target and at least four more years have been added to the period of planned cuts. The government’s proposed spending cuts, if less than previously announced, will still eat into public services, already cut to the bone. At the same time, proposed spending on education and the health services will be way less than needed to meet an ageing population and the costs of tertiary education and training. Of course, part of the reason the government could not achieve the balance was that it gave huge handouts to big business. The corporation tax rate will be reduced this year to just 20% (and most corporations do not even pay this rate out of profits because of exemptions and allowances). 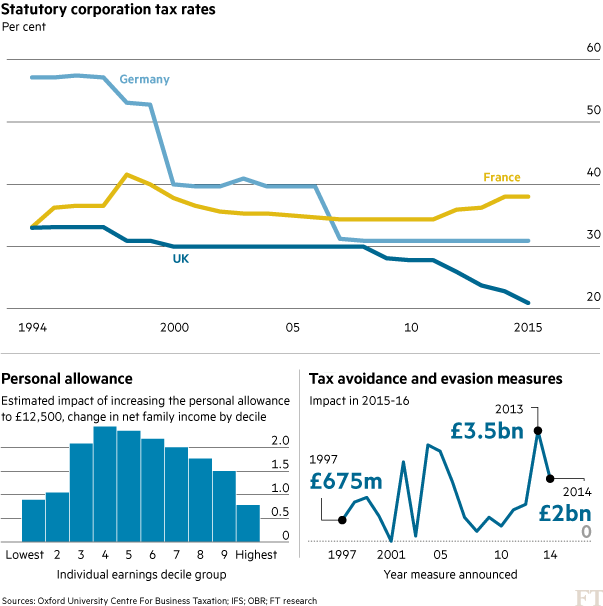 Osborne boasted that this was the lowest rate among major economies. He stated that, as it was private companies that ‘created’ jobs (apparently the public sector has no employees), any hike in corporate tax was a tax on jobs! In contrast, through VAT and other taxes, the total tax bill for workers still rose £16bn during this parliament. Even that statement about the rich being hit hardest is not correct. That’s because there has been a huge rise in property prices and the stock market since 2010, assets mainly held by the richer households. Their wealth has risen sharply under this government while those without homes of their own struggle with rising private rents, disappearing cheaper ‘social housing’ and wages that cannot keep pace with the cost of living. And at best, that’s the prospect under another Conservative government. 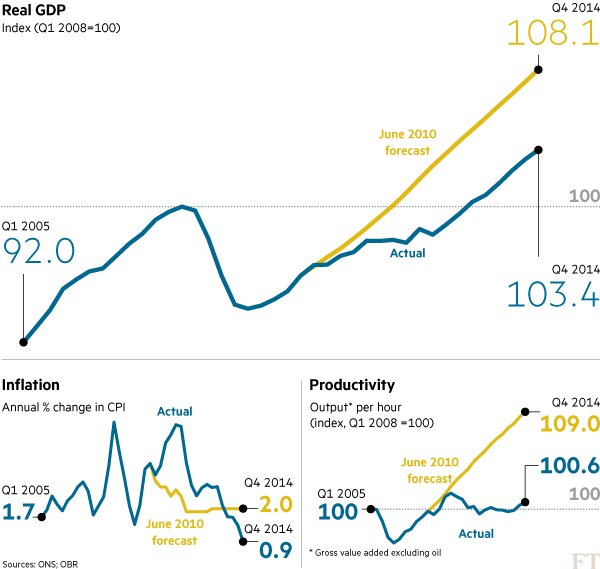 At worst, expect another deep recession throwing all these forecasts to the wind as they were last time. This entry was posted in Austerity in UK, Budget 2015, Inequality, Michael Roberts, The People's Assembly Derby and tagged austerity, Budget 2015, Conservative Party Vampire Squids, Derby, Derby People's Assembly, DERBYSHIRE, Inequality, Michael Roberts. As I write this, some of the best-paid brains in Europe are puzzling over what happens when the inevitable suddenly becomes impossible. For the past half-decade, Greece was run by machine politicians who took orders from their northern European creditors and stamped on their own voters – slashing their pensions, selling their national assets and wrecking their economy. The weekend’s elections put an end to that cosy, monstrous system. And so in banks across the continent, analysts handier with statistical probabilities than political unknowns tweak their models. Ministers and pundits look on the tumult in Athens and wonder how to shape it into a glib one-liner. Amid such febrility, it’s natural to want to pass the first verdict on Syriza – and completely dishonest to do so this early. The coalition of leftists numbers Maoists and Trotskyists, alongside others who sound more like Roy Hattersley. Rather than soundbites and polling, their expertise is typically in Japanese monetary policy or Lacanian philosophy. Tony Blair’s eager young shavers – glued to their BlackBerrys for the next line from HQ – they are not. But instead of speculating about Syriza’s future, we should draw one vital lesson from its very recent past – one that Ed Miliband and his inner circle ought to learn too. Because there’s no way that Alexis Tsipras would have been sworn in as prime minister had it not been for the disastrous and ultimately suicidal behaviour of Labour’s sister party in Greece, Pasok. 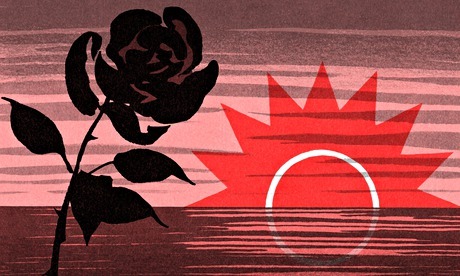 The death of the country’s main centre-left organisation has been swift and spectacular. This entry was posted in Greece, Labour, The People's Assembly Derby and tagged austerity, Derby, Derby People's Assembly, Fight Austerity, Greece, Labour. This entry was posted in Austerity in UK, fear and death”: remembering life before the NHS, Harry Leslie Smith, Solidarity, The People's Assembly Derby and tagged austerity, Derby, Derby People's Assembly, Derby People’s Assembly against Austerity, DERBYSHIRE, fear and death”: remembering life before the NHS, filth, Harry Leslie Smith, Hunger, Solidarity. This entry was posted in Austerity in UK, Fight the Cuts, Inequality, Solidarity, The People's Assembly Derby, X Conservative Party Paymasters and tagged austerity, Austerity Fight The Cuts, Derby, Derby People's Assembly, Derby People’s Assembly against Austerity, Fight Austerity, Real News Network, Solidarity, Workers Victims. The Derby Area Trades Union Council coaches for this march will leave Full Street (adjacent to the Assembly Rooms) at 9.00 am on Saturday June 21st and will also collect people at the UNITE office in Pride Park at 9.15 am. The coaches are FREE. This entry was posted in Austerity in UK, Fight the Cuts, Inequality, Solidarity, The People's Assembly Derby and tagged austerity, Austerity Fight The Cuts, Derby, Derby Area Trades Union Council, Derby People's Assembly, Derby People’s Assembly against Austerity, DERBYSHIRE, Fight Austerity, London, Solidarity, Transport 21st june.